If the connected map can't be seen from anywhere in the origin map, then there's no need to create a map connection for these two maps at all. The strip covers the part of the connected map that can be seen anywhere from the origin map. Due to the gameboy window size, it may be necessary to take a margin of up to 3 blocks in order to cover all the viewing range. Pointer to the block inside the strip with the lowest ROM address. In a map editor for instance, we can easily see that Cherrygrove City's width (w) is 0x14 and that its height (h) is 0x09. As this is an horizontal connection and both maps have the same height (and are perfectly aligned), offset Y will be null. where w is the connected map width, that is, Route 29's width. Hence, w = 0x1E. with w = 0x14 (Cherrygrove City's width). where w es 0x14 and V is considered 0x100 because it is Pokemon Crystal. where X is the horizontal offset. To calculate the X offset we take the horizontal position of the leftmost block of the origin map minus the horizontal position of the leftmost block of the connected map's strip. Then, we count the number of blocks the latter is displaced relative to the former (see reference picture). In this case, the number of blocks of displacement is 5.
which outputs a Strip Destination of 0x08 0xC8. If we had a horizontal connection instead and we had to calculate the Y (vertical) offset, we'd take the vertical position of the upmost block of the origin map minus the vertical position (in blocks) of the upmost block of the connected map's strip, and finally count the displacement between the two. The remaining paramenters are calculated in a similar way as shown in the previous two connections, but bearing in mind that the formulas to pick this time are those corresponding to north-bound connections, and that the horizontal offset has a value of 5. Notice how the vertical offset is never present in the north | south formulas, and vice versa. For this last connection, we are only going to expand on the significative differences with the previous connections. When determining the strip, we have to keep in mind that the connected map is wider than the origin map. Thus, the strip not only has to cover the 3-block vertical margin, but also a 3-block horizontal margin in both sides to cover all the viewing range from Route 30. (see reference picture). Knowing that, the strip length will turn out to be Route 30's width + 6, that is, 0x10. To calculate the horizontal offset, just like in the previous connection, we have to take the horizontal position of the leftmost block of the origin map minus the horizontal position of the leftmost block of the connected map's strip, and then, we count the number of blocks the latter is displaced relative to the former (see reference picture). 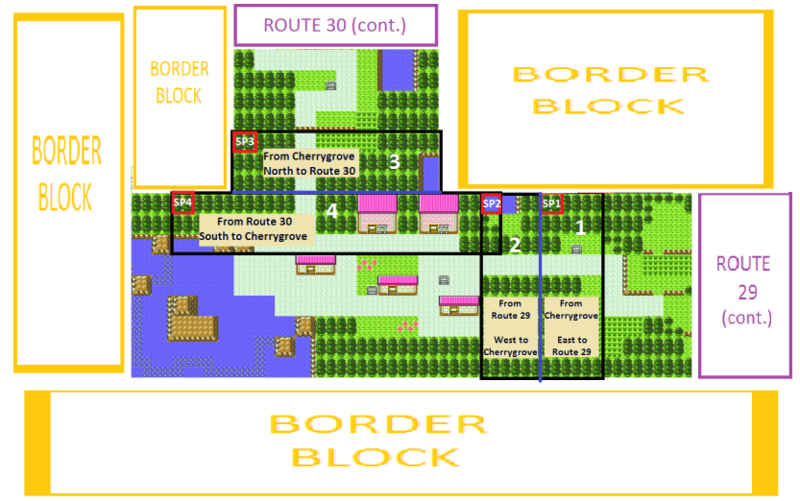 In this case, the connected map's strip (Cherrygrove City) begins three blocks more to the left ("before") than the origin map (Route 30). This means that we are going to work with a negative X offset of -3. This offset value of -3 will serve us calculate the Strip Destination, but to calculate the horizontal align, vertical align, and window (parameters that aren't related to the strip), the horizontal offset will be different. In these cases, we don't have to take the leftmost block of the connected map's strip, but the leftmost block of the connected map, which translates to an offset of -5 (see reference picture). In the connection (3) there was no difference between the offset used for the Strip Destination and the offset used for the subsequent parameters, since the position where the strip began matched the position where the whole map began (see reference picture). Thanks for this tutorial, that is very neat and handy and I seem to be able to connect different maps. pokecrystal now has connection macros like pokered. I'll check them out better after work, but that looks like it will be really helpful... both the switch to macros, and the calculator. One thing I picked up that you should probably add here would be an example of calculating values in a situation when the result is negative. It's self-explanotary when you understand how substractions with the processor work but before that... not so much. Noticed that you actually had that information there - didn't really read the thread carefully enough.